The Windows Live team is reporting on their blog the Windows Live Calendar service is now out of beta, ready for action, and being rolled out in 45 languages. After being in beta for several months, the team has been tweaking, bug fixing, and responding to user feedback...and it shows! 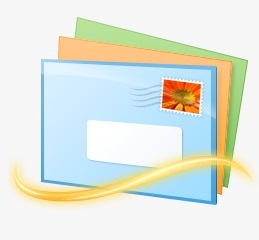 If you haven't yet tried it, you should - the Windows Live Calendar is a great online calendar service...and it syncs with both Windows Live Mail and Outlook with Microsoft Office Outlook via the Outlook Connector. One of the better features of this calendar service is the “expandable weeks” option. Since most people look at their calendars in month view, you’re usually only able to see a limited number of events in that view. 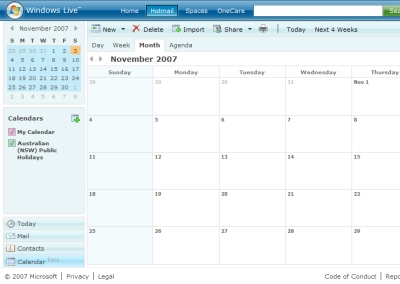 However, with Windows Live Calendar, you can stay in month view but click “Show More” in the top right corner of the calendar to have the calendar always show all your events. You can also click the “# more” link (where # is a number of events) to expand just one week. 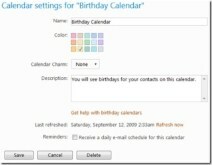 Another fun feature in Windows Live Calendar are the "charms" (little icons) which you can add next to your event. A little heart for your anniversary or a little movie reel for your dinner-and-a-movie date perhaps? The charms give your Calendar some personal flair. There are tons of other great tips and tweaks which you can learn about, too – just check out the team's blog post for more info. Oh and the calendar is now supported by the Safari web browser…and you know what that means!